Rising indie sales company Glass House Distribution has set September 12th as the launch of festival audience fav “Sugar!”, starring multi-hyphenate musician, actress and Broadway regular Alice Ripley and the long-tenured acting veteran Robert Clohessy (The Wolf of Wall Street). Directed & edited by Shari Berman and written by Leora Kalish, the movie showcases the singing & acting talents of Tony Award Winner Ripley as a housewife and 50+ year old piano teacher who decides to follow her lifelong dream of becoming a rock star, much to the chagrin of her husband (SAG Award Winner Robert Clohessy) who’s running for political office and her daughter (upcomer Leah Barker) who’s about to embark for college. Produced by Robert Kalish, Blaze Kelly Coyle and Lauren Rayner P.G.A., the movie has been making the festival circuit and has already picked up a dozen accolades along the way. "We're all meant to dream. And it means the world to me to have a story I dreamt up and eventually wrote on its way to distribution with Glass House”, said Kalish. In addition to Glass House Distribution, Sugar Film LLC and Silver Phoenix Entertainment round out the company credits on the production. 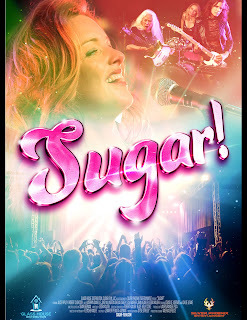 “Sugar is a really moving film about the results of following your dreams, and it’s inspiring to know that dreams really have no age limits,” said Tom Malloy, President of Glass House Distribution. Glass House Distribution is an international sales & distribution company specializing in independent feature films, documentaries and series. Since the company’s founding less than two years ago, Glass House has grown steadily through sales & acquisitions at the markets, and has a robust slate and a prominent office secured for AFM 2017. Most recently, Glass House’s original series Dropping the Soap received an Emmy Nomination for star Jane Lynch for Best Actress. With its simple guiding motto of “Full Transparency,” (hence the “Glass House”), as well as a high bar for quality fare, Glass House is on a course to be one of the future leading sales companies and has already generated buzz as one of the upcoming sales agencies. The Glass House team is comprised of Founder Bryan Glass and President Tom Malloy in NY, and Sales & Acquisition Executives Michelle Alexandria and Robert Deege in LA.